Hello there! Have you had the chance to look inside Hero Arts Holiday 2016 catalog (scroll down on that page to view it)? It is full of creative goodness! I’ve been browsing it lately when I feel I lack inspiration. The new products are not available yet (when I’m writing this post, I will update the post later to include links), they will be available in Hero Arts store is Monday, August 22nd and you’ll start seeing them at your favorite retail shops after August 1st. So here comes the traditional end of Summer debate – is it too early for Christmas Cards? In my book, its never too early. If I feel inspired to make a Christmas card in July, I’ll make a Christmas card in July. And that’s okay. 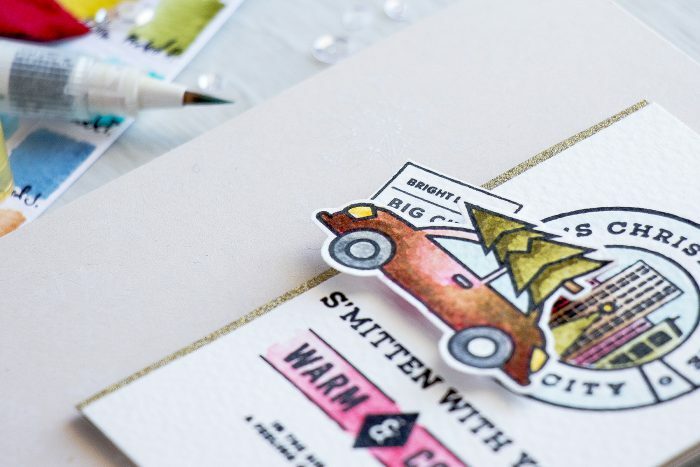 I used several small stamp sets from Kelly Purkey to stamp this project. I don’t think I’ve ever used her stamps before and I really liked the graphic look, I have another card, similar one, created using her stamps, I’ll be sharing it soon. 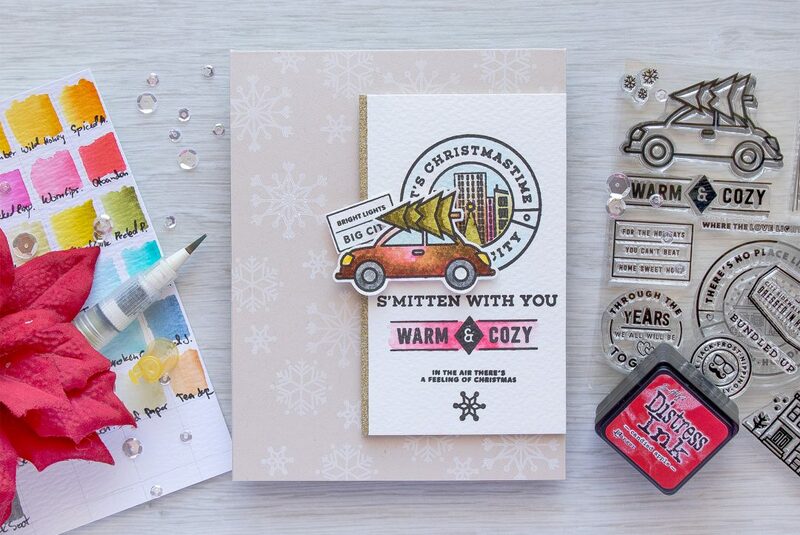 The car image as well as Warm & Cozy sentiment came from the Warm & Cozy stamp set. All images on this project were stamped in Versafine Onyx Black onto watercolor paper and colored with Distress inks. The car was first colored in Festive Berries (you can spot a bit of red-pink around the door pull), but I also added a lot of Forest Moss to the bottom part of the car to imitate mud. Imagine the car driving to the forest to get a tree and it gets all muddy and dirty – this is the look I was going for. The It’s Christmastime image came from another set, Kelly’s It’s Christmastime and so did the Bright Lights Big City sign behind the car. I also used Kelly’s S’Mitten Stamp & Cut to stamp Smitten with You and I also used snowflakes from that stamp set to stamp a white snowflake background. I also added a strip of Gold Glitter paper to my watercolor panel and foam mounted it onto a tan card base. 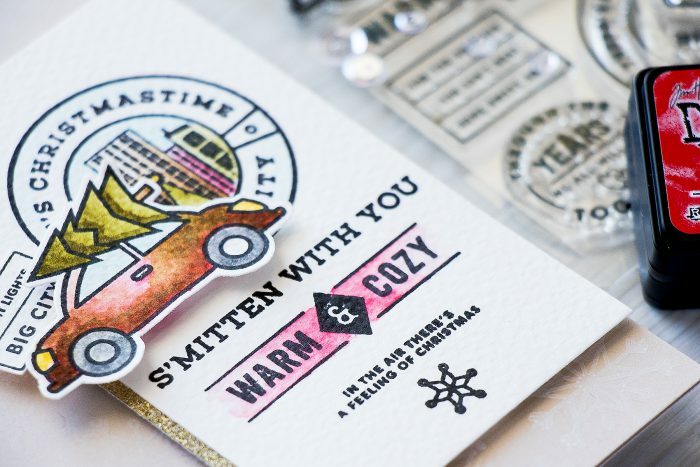 I really like this simplicity of these cards and the images and sentiments in Kelly’s stamp sets. Great card! Love it’s graphic and urban look. I’m suffering here from summer and your card makea me desire a winter in the city even more intense. 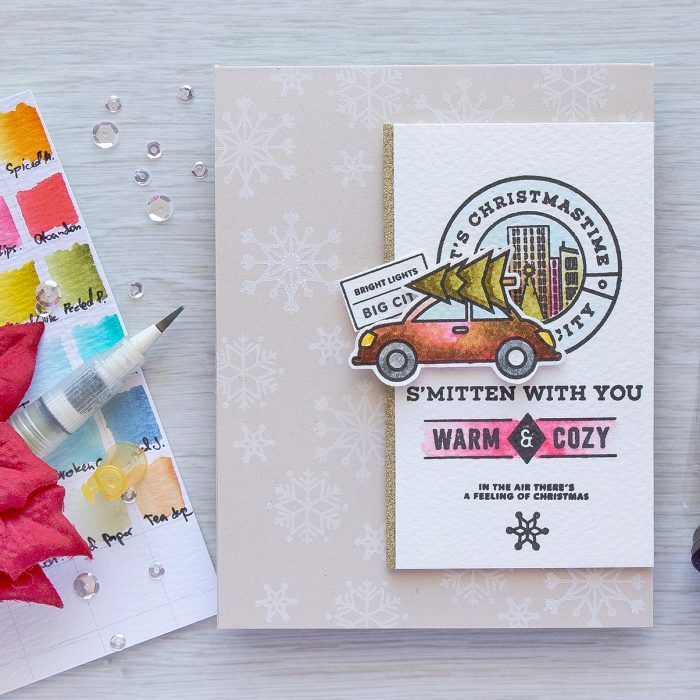 This is a great card Yana, its never too early to make Christmas cards. Had to browse through the catalog and there is a LOT of AMAZING stamps and dies in there that I love. WOWZERS!